High School Classmate of Christine Blasey Ford: "This Incident Did Happen"
You can read King’s personal note here. Like Ford, though to a much lesser extent, King is now being abused online as a result of speaking out. I signed this letter -it makes me proud to have attended Holton Arms. The current situation involving Dr. Christine Blasey Ford and Supreme Court Justice nominee Brett Kavanaugh touches a very personal nerve and has unearthed memories, good and bad, that I had buried deep from my time at Holton. I graduated from Holton, and knew both Brett Kavanaugh, not well, and Mark Judge. I remember having a bit of a crush on Mark, he had a keen intelligence and sardonic, biting wit when he wasn’t drunk which was often (as were lots of teenage guys from Prep, Landon and girls from Holton, Stone Ridge, Visitation on weekends at parties, during Beachweek, etc). I asked him to go to my junior or senior prom with me, can’t remember now which one. I just remember how horrible I felt when he stood me up because he got bombed a few hours before the prom dinner. He showed no respect and had no remorse. Apparently, in 2018 some things have not changed, unfortunately. Christine Blasey Ford was a year or so behind me, I did not know her personally but I remember her. This incident did happen. Many of us heard a buzz about it indirectly with few specific details. However Christine’s vivid recollection should be more than enough for us to truly, deeply know that the accusation is true. We are all in some way from that time, at least me, Christine, and I applaud her courage and her dignity. The drinking ensconced in the puritanism and hypocrisy of that elite, privileged , mostly white, Catholic, Washington society, was completely out of control. I recall having a few parties at my house and having to call the cops once on my own party. We were teenagers and did really stupid, abusive, dangerous things. Nobody here has the moral authority over anyone else no matter what elite school or college or brilliant career and beautiful family he or she may now have. 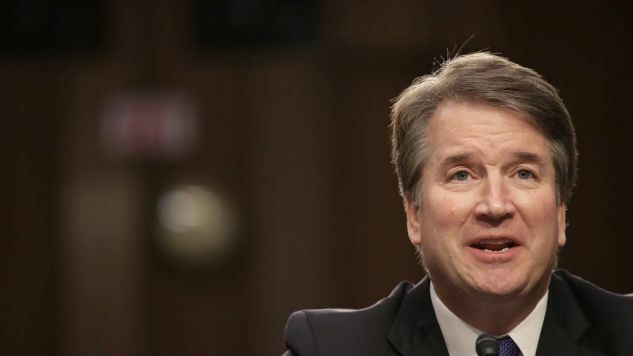 I invite the women who stepped up in support for Kavanaugh in their letter, in addition to writing about what a good person, great athlete, student, family man, and brilliant professional Brett Kavanaugh is, and he may well be all those things, to reflect on their use of the word “integrity” to describe him and to really think about who they are supporting and why. In my case, even before Christine came forward, I was and still am completely against his nomination. I do not want him representing me or making decisions on my behalf in the Supreme Court as he goes against everything sacred to me as woman, mother, daughter, latina, American and professional. No matter how fine a person and “upstanding” citizen he may be. If Kavanaugh truly has the integrity mentioned by those who support him, then he should be just as courageous as Christine and stop trying to dodge the accusations, admit his actions from so long ago, speak from the heart, and apologize. By doing this, he would be giving the next generation and our kids/teenagers a huge lesson in humility, dignity and humanity. Those would be the actions of a person we want in the Supreme Court. We want a person who has erred in his life, who has not “turned the other cheek” as he is now doing, who is not afraid to embrace his flaws, mistakes, and weaknesses because it is this kind of person whom we can trust to make the difficult decisions and who will truly value human life and liberties. Being an “outstanding student, athlete, ..with a wide circle of friends” is way too superficial and does not do it for me. Not enough. My heart goes out to all involved who are now whether they like or not, facing their demons, which are never pretty nor easy to dialogue with, but they are necessary in order for us to accept that we are all flawed and ultimately, human.